In order to grow the company’s export sales into Europe, Draper Tools recognised the need for a multi lingual product range catalogue and product instruction manuals. These documents required translating into several languages for Drapers’ complex products and required specific tool related terminology. We needed to find and work closely with a company that could not only ensure the accuracy of the entire translation process but were also able to fulfil our very specific document requirements, in short not just a translation house! After much research London Translations were chosen to test these very unique requirements on some pilot product manual translations. 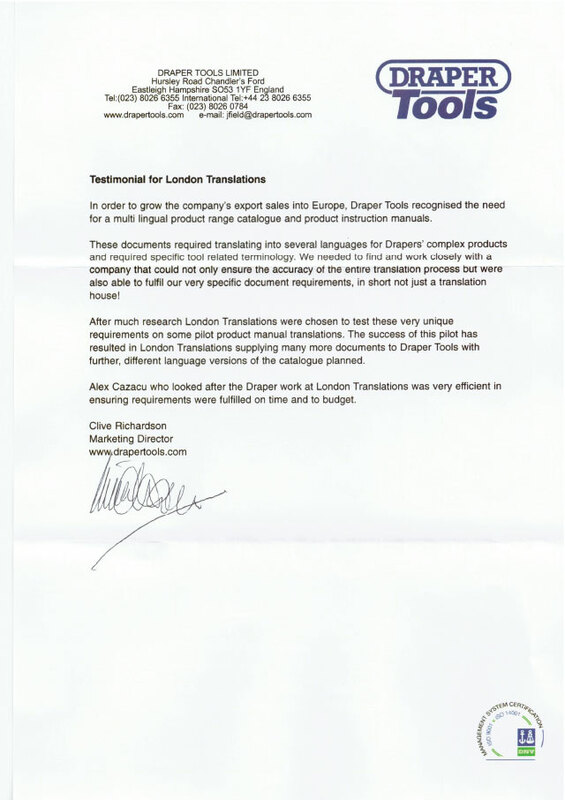 The success of this pilot has resulted in London Translations supplying many more documents to Draper Tools with further, different language versions of the catalogue planned.